There are 83 Assisted Living Facilities in the Lansdale area, with 4 in Lansdale and 79 nearby. The average cost of assisted living in Lansdale is $3,700 per month. This is higher than the national median of $3,346. To help you with your search, browse the 496 reviews below for assisted living facilities in Lansdale. On average, consumers rate assisted living in Lansdale 4.2 out of 5 stars. Better rated regions include Harleysville with an average rating of 4.3 out of 5 stars. Caring.com has helped 7 families in Lansdale find high-quality senior care. To speak with one of our Family Advisors about assisted living options and costs in Lansdale, call (855) 863-8283. Just 28 miles from Philadelphia, the city of Lansdale is the center point of North Penn Valley and features many activities that seniors enjoy like golf, art classes, and even gardening classes. Lansdale is also home to four assisted living facilities, also referred to as personal care homes. There are another 59 facilities located nearby. These facilities are regulated and licensed by the Pennsylvania Department of Human Services. Each is designed to offer assistance to seniors with tasks associated with daily living, and some also provide assistance for seniors with disabilities or conditions like dementia. Lansdale has an array of resources for seniors, including the PEAK Center, which features a popular lunch program, Medicare counseling, AARP driving courses, legal counseling, bingo, group trivia, wood-carving, art classes, and supervised trips to regional attractions. The Lansdale area is home to world-class medical facilities, including Lansdale Hospital, in the event of medical emergencies or illness. The city of Lansdale and neighboring communities feature multiple cultural attractions that many area seniors enjoy like the Byer’s Choice Christmas Museum, Ambler Arboretum, and Peter Wentz Farmstead. Seniors who are concerned about community safety may find comfort in knowing Lansdale has a crime rate of 1,292 annual crimes per 100,000 people, which is well below the national average of 2,837. Lansdale is served by SEPTA Regional Rail and SEPTA Suburban Division bus routes. Seniors who plan to rely on public transportation may be pleased to note that SEPTA provides free rides for seniors 65 and over. Seniors concerned about the cost of living should note that Lansdale has a cost of living index of 114, which is substantially above the national average index of 100. Assisted Living costs in Lansdale start around $3,700 per month on average, while the nationwide average cost of assisted living is $4,000 per month, according to the latest figures from Genworth’s Cost of Care Survey. It’s important to note that assisted living rates in Lansdale and the surrounding suburbs can vary widely based on factors such as location, the level of care needed, apartment size and the types of amenities offered at each community. 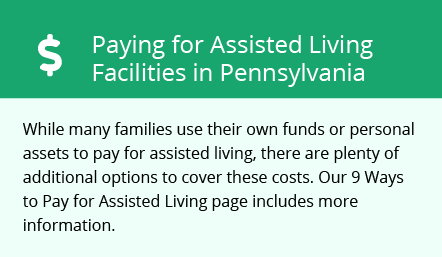 Currently, Pennsylvania is one of several states that does not offer waivers or public assistance for seniors to help pay for care at an assisted living facility. Pennsylvania currently offers waivers to help pay for nursing home care and in-home support for seniors aging in place. Qualifying seniors who receive SSI may be eligible for a monthly supplement to pay for assisted living facility care. Learn more about these programs, plus who’s eligible, on our Assisted Living in Pennsylvania page. For more information about different ways to finance assisted living, visit our Assisted Living in Pennsylvania page. Lansdale and the surrounding area are home to numerous government agencies and non-profit organizations offering help for seniors searching for or currently residing in an assisted living community. These organizations can also provide assistance in a number of other eldercare services such as geriatric care management, elder law advice, estate planning, finding home care and health and wellness programs. To see a list of free assisted living resources in Lansdale, please visit our Assisted Living in Pennsylvania page. Lansdale-area assisted living communities must adhere to the comprehensive set of state laws and regulations that all assisted living communities in Pennsylvania are required to follow. Visit our Assisted Living in Pennsylvania page for more information about these laws.